Helitrons are a class of transposable elements which have been identified in a number of species of plants, animals and fungi. They are unique in their proposed rolling-circle mode of replication, have a highly variable copy-number and have been implicated in the restructuring of coding sequences both by their insertion into existing genes and by their incorporation of transcriptionally competent gene fragments. Helitron discovery depends on identifying associated DNA signature sequences and comprehensive evaluation of helitron contribution to a particular genome requires detailed computational analysis of whole genome sequence. Therefore, the role which helitrons have played in modelling non-model plant genomes is largely unknown. Cloning of the flowering gene GIGANTEA (GI) from a BAC library of the Pooideae grass Lolium perenne (perennial ryegrass) identified the target gene and several GI pseudogene fragments spanning the first five exons. Analysis of genomic sequence 5' and 3' of one these GI fragments revealed motifs consistent with helitron-type transposon insertion, specifically a putative 5'-A↓T-3' insertion site containing 5'-TC and CTAG-3' borders with a sub-terminal 16 bp hairpin. Screening of a BAC library of the closely related grass species Festuca pratensis (meadow fescue) indicated similar helitron-associated GI fragments present in this genome, as well as non-helitron associated GI fragments derived from the same region of GI. In order to investigate the possible extent of ancestral helitron-activity in L. perenne, a methylation-filtered GeneThresher® genomic library developed from this species was screened for potential helitron 3' hairpin sequences associated with a 3'-CTRR motif. This identified 7 potential helitron hairpin-types present between at least 9 and 51 times within the L. perenne methylation-filtered library. This represents evidence for a possible ancestral role for helitrons in modelling the genomes of Lolium and related species. Helitrons are a class of transposons which are unique in their proposed rolling-circle mode of replication mediated either autonomously by an internally coded putative DNA replication-initiator-helicase protein, or non-autonomously. They have been identified in a number of species of plants, animals and fungi and can have a highly variable copy-number, from an infrequent representation in many mammals to contributing up to 5% of the genome size in some Drosophila species (see reviews by [1, 2]). They show considerable size variation (0.5 – > 15 kb for Arabidopsis helitrons, ) and, unusually, helitron transposition does not give rise to duplication of target sites. Helitrons insert within 5'-A↓T-3' target sites within the genome and can be recognised by conserved 5'-TC.. and ..CTRR-3' termini with, typically, 16–20 bp hairpin motifs 8–12 bp from the 3' termini. A feature of helitron transposons is their ability to incorporate multiple genomic gene fragments which can still show transcriptional activity – thus creating the potential for novel truncated, alternatively spliced and chimeric mRNAs and proteins . The mechanism by which helitrons incorporate gene fragments is not clear, though it is presumably associated with mutation or misidentification of recognition sites during the replication process, and models which describe the acquisition of gene fragments both at the 5' and at the 3' end have been proposed [1–4]. In rice, Arabidopsis and maize, the extensive genome resources have facilitated in silico identification of helitrons in these and related genera [3, 5–7]. Helitrons identified in maize [4, 8–12] and Ipomoea tricolor  have generated particular interest due to their proposed actions in creating haplotypic diversity and influencing gene function. Lolium perenne (perennial ryegrass) and Festuca pratensis (meadow fescue) are members of the 'Lolium/Festuca complex' of interfertile grasses which form the basis of many grassland agricultural and amenity systems in temperate areas of the world. They belong to the Pooideae sub-family of the Poaceae, along with the Triticeae cereal crops and Brachypodium distachyon, the rapidly developing model for monocot species. The haploid genome sizes of L. perenne and F. pratensis are estimated to be c. 2 Gb [14, 15], less than half the size of barley and the constituent genomes of hexaploid wheat [16, 17] but c. 6–7 times the size of B. distachyon and rice . Consequently, the intermediate genome sizes of L. perenne and F. pratensis between B. distachyon and the Triticeae cereals and the close evolutionary interrelationships of these Pooideae species, makes the Lolium/Festuca grasses of great interest in terms of understanding the processes which influence the evolution of genome organisation and size in close relatives. GIGANTEA (GI) was originally identified as a key gene in the perception of circadian rhythms and the photoperiodic control of flowering by mutation analysis in Arabidopsis [18, 19]but it is only recently that detailed knowledge of the mode of action and interaction of this gene has become available [20–23]. Comparative genome analysis between dicots and monocots has indicated that orthologues of many of the key genes involved in flowering in Arabidopsis also exist in rice and other monocots [24–26] and experimental evidence indicates that similar control mechanisms may be involved in some cases [27–31] including for GI [32, 33]. Consequently, the identification of the orthologues of GI in L. perenne and other monocot crop species has been a desirable goal, partly to ascertain if it is implicated in flowering control in current breeding populations through QTL/genetic mapping studies but also to identify allelic variants which may be useful in future population development. In this study we describe how, in the process of cloning the L. perenne orthologue of GI from a BAC library, we identified GI pseudogene fragments associated with helitron-type sequences. Similar sequences were found to be also present in the F. pratensis genome. Additionally, we describe the use of a methylation-filtered L. perenne genomic library in an initial survey to ascertain the potential frequency of helitrons within the L. perenne genome. A primer pair, GIG49660.6F/7R (see Table 1 for primer sequences) was designed based on conserved regions spanning the first and fourth exons in existing GI sequences from other monocot species. This primer pair was tested on a range of genotypes from a L. perenne mapping family (see Methods) and two distinct, non-segregating bands of 525 and 536 bp were amplified. Sequencing of these PCR products indicated the 536 bp was likely to be a fragment of the expected GI gene, whereas the 525 bp band consisted of an apparent GI pseudogene fragment. PCR screening of an L. perenne BAC library (5 genome equivalents) with a second primer pair, GIGgt2F/2R, designed directly upon derived L. perenne genomic sequence, estimated between 4 and 5 GIGgt2F/2R priming sites per genome (see Additional File 1 for derivation of this estimate). Four GIGgt2F/2R-positive BAC clones were isolated from the library; one contained GIGANTEA (LpGI) and 3 contained apparently non-allelic GI pseudogene fragments (Lp-psGI1–3). Primer pair GIGgt2F/2R was also screened on the 2.5 genome equivalent F. pratensis BAC library and, again, an estimate of 4–5 priming sites per genome was obtained (see Additional File 1). However, the PCR products amplified from the F. pratensis BAC library were of two distinct types, one type in the expected range and the other type smaller than expected. This latter type was subsequently confirmed by sequencing to be a truncated version of the GI pseudogene. Both BAC libraries were also screened with the GI specific primer pair GIGgt1F/1R. and the assay results estimated 1–2 copies per genome for the L. perenne library and 1 copy per genome for the F. pratensis library (see Additional File 1). All the BAC library DNA screening pools identified by primer pair GIGgt1F/1R in both libraries were also identified by primer pair GIGgt2F/2R, indicating that both Lp/FpGI and Lp/Fp-psGI sequences were amplified by the latter primer pair. The region of one the BACs containing the LpGI gene (identified by the GIGgt1F/1R screen) was sequenced directly and the genomic region containing LpGI identified. The gene structure was predicted with FGENESH+, using an existing L. perenne GI protein sequence (ABF83898) as template and spanned 6024 bp from initiator to terminator codons. Fourteen exons coded for a protein of 1148aa which showed 99% homology with the existing L. perenne GI protein sequence (ABF83898) and 92%, 91% 88% and 66% with homologous GI sequences from barley (AAW66946), wheat (AAQ11738,) rice (BAF04134) and Arabidopsis (ABP96502), respectively (Additional File 2). LpGI was mapped to chromosome 3 of a L. perenne mapping family to a position compatible with the known syntenic relationship between L. perenne chromosome 3 and rice chromosome 1 (King et al., 2007; J. King, unpublished data). Between c. 8 and 11 kb of the 3 BACs containing the different Lp-psGI fragments (Lp-psGI.1–3) were sequenced directly from the BAC. Alignment of these sequences identified regions of partial homology between Lp-psGI.1 and Lp-psGI.2 of c. 6 kb and between Lp-psGI.1/.2 and Lp-psGI.3 of c. 5.6 kb. Insertions of c. 0.8 kb and 0.2 kb interrupted the homologous regions in Lp-psGI.1 and Lp-psGI.2, respectively. The 3' end of the homologous regions were terminated in all the Lp-psGI sequences by conserved regions containing a 14 bp motif (16 bp in Lp-psGI.1 and Lp-psGI.3) capable of forming a hairpin structure – characteristic of the 3' termini of helitron-like transposons (Fig. 1). Lolium perenne and Festuca pratensis helitron sequences containing GIGANTEA gene fragment. Helitron sequences conserved between Lp-psGI.1 and/or Lp-psGI.2/.3 and Fp-psGI.1 (thick black bar); helitron sequence unique to Lp-psGI.1 (thin black bar); non-helitron genomic sequence (thin grey bar); putative gene fragments (thick grey bar): a = succinate dehydrogenase, b = non-LTR retroelement, c = ribosomal protein, d = GIGANTEA. Sequence: detail of 3' helitron border illustrating hairpin motif and 3' terminus. BLAST comparisons of the Lp-psGI sequences against the L. perenne GeneThresher ® (LpGT) library identified 10 individual LpGT sequences with homology to Lp-psGI.1 both at the 5' and 3' ends, with the homology interrupted by a 7501 fragment inserted into a potential helitron 5'-A↓T-3' target motif (Fig. 2). The borders of the 7501 bp insert consisted of a 5'-TC and 3' 16 bp conserved hairpin and CTAG motifs, consistent with known helitron structures (Fig. 1 and 2). No evidence of a potential DNA replication-initiator-helicase protein coding sequence was identified within the 7501 bp fragment, indicating that it was likely to represent a non-autonomous helitron. No LpGT sequences could be identified which spanned potential intact helitrons in Lp-psGI.2 or Lp-psGI.3, indicating that the 5' regions of these putative helitrons may have been displaced. However, 2 different LpGT sequences were identified with homology beginning immediately beyond the conserved CTAG 3' helitron terminus of Lp-psGI.2. In both these LpGT fragments the homologous regions began at a potential 5'-A↓T-3' helitron insertion site (Fig. 3). Three further LpGT sequences were identified with partial homology to the same internal region of Lp-psGI.2. In each of these fragments, the homology ended at potential 5'-A↓T-3' helitron insertion sites (Fig. 3). This may represent the border of a smaller ancestral helitron, which subsequently expanded in the 5' direction. Sequences derived from the L. perenne GeneThresher library ( Lp GT) with homology to flanking regions of the complete helitron sequence Lp -psGI.1. Identifiers for the LpGT sequences are: 1) FLPB002709C17-g0RSP_20020409, 2) FLPB002048C23-g0RSP_20011109, 3) FLPB002662H10-b0FSP_20020409, 4) FLPB001026M06-g0RSP_20010815, 5) FLPB001057C01-g1RSP_20010815, 6) FLPB001013B03-g0RSP_20010815, 7) FLPB002024D17-b0FSP_20010827, 8) FLPB001091D09-b0FSP_20011203 (see Additional File 5). Diagrammatic representation and sequence details of alignments between Lp GT sequences and Lp -psGI.2, indicating possible ancestral 5' (left) and 3' (right) helitron borders.Diagram: sequence within helitron borders conserved (thick black bar) and not conserved (thin black bar) between Lp-psGI.1 and Lp-psGI.2; non-helitron genomic sequence (thin grey bar). LpGT sequences homologous (thick grey bar) and non-homologous (thick white bar) with Lp-psGI.2. Sequence details: alignments between Lp-psGI.2 and LpGT sequences showing potential A↓T helitron insertion sites; these indicate possible ancestral 3' and 5' borders for different helitron insertion events and also mark the borders of Lp-psGI.1 and Lp-psGI.2 homology. LpGT sequences: a) FLPB002289H22-b0FSP_20020409, b) FLPB002413G09-b0FSP_20011203, c) FLPB002264M19-g0RSP_20011109, d) FLPB002078I09-b0FSP_20010827, e) FLPB002029F17-g1RSP_20010827 (see Additional File 5). Within all the Lp-psGI sequences, the LpGI-like fragment consisted of a continuous region of c. 0.9 kb from 35 bases 5' of the ATG initiation codon to 91 bases into the fifth exon (Fig. 4). Clustal alignments of the 3Lp-psGI sequences with LpGI over the c.0.9 kb conserved region indicated different degrees of sequence conservation in exon- and intron-derived regions. Excluding base insertions and deletions, LpGI showed 83–86% sequence conservation with the Lp-psGI sequences within the exonic regions but this dropped to 72–73% within the intronic regions. Within the 3 Lp-psGI sequences the ranges of sequence conservation within 'exonic' and 'intronic' regions were 94–98% and 95–97%, respectively (Table 2). Diagrammatic representation of region of GIGANTEA ( GI ) that has been ancestrally incorporated into a helitron. Black horizontal bar = L. perenne genomic sequence spanning the complete GI coding sequences; predicted exons are indicated by the thick bar. Grey horizontal bar indicates putative complete helitron sequence from Lp-psGI.1; relative position of the GI fragment incorporated into the helitron is indicated by the thick grey bar. Sequence detail shows 3' border of conserved GI region with putative helitron A↓T insertion site at the border. Percentage sequence similarity comparing the L. perenne (Lp) and F. pratensis (Fp) pseudo-GIGANTEA (-psGI) regions and the equivalent region of L. perenne GIGANTEA over introns and exons. 1 Sequence similarity excluding base deletions and insertions (reflecting base substitutions). Additional gene fragments were identified 5' of the GI conserved region. A ribosomal protein S7 fragment was present approximately 1 kb upstream of GI in all of the Lp-psGI sequences while a succinate dehydrogenase (SDH) fragment was found close to the 5' end of the helitron in Lp-psGI.1 alone. Both of these fragments contained exon and intron sequences. A 0.8 kb insert specific to Lp-psGI.2 was found to contain a fragment of a non-LTR retroelement, including a partial reverse transcriptase reading frame, which most likely results from a retrotransposition event unrelated to helitron activity (e.g. TBLASTX match with AF474071.1, barley clone) (Fig. 1). Three different psGI-type sequences (Fp-psGI.1–.3) were cloned from the F. pratensis BAC library on the basis of identification with primer pair GIGgt2F/2R. Comparison of these with the Lp-psGI sequences showed that one, Fp-psG1.1, represented a helitron remnant sequence which was highly similar to the Lp-psGI sequences, indicating a likely similar origin (the 6686 bp putative helitron region of Fp-psGI.1 showed 90% homology with Lp-psGI.1). 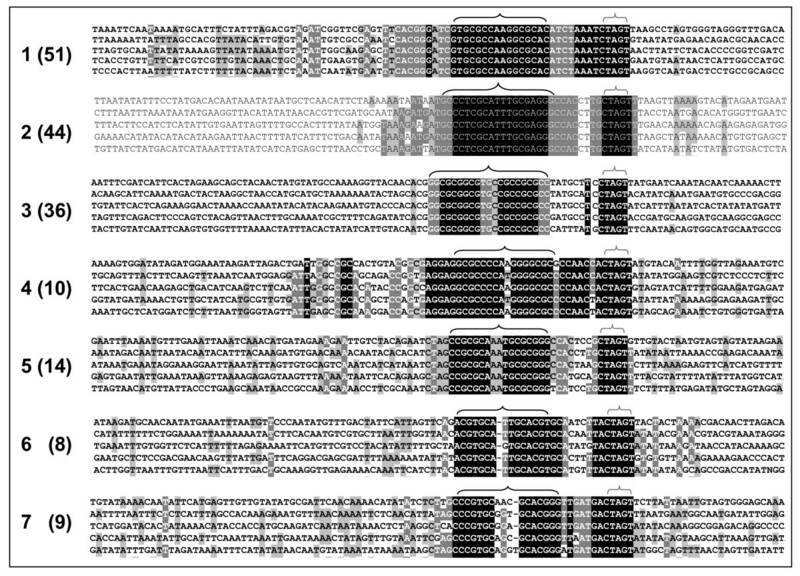 Fp-psGI.1 contained a similar 3' terminus to the Lp-psGI sequences and the same SDH fragment near its 5' terminus (Fig. 1). However, Fp-GI.2 and .3 were noticeably different. Fp-psGI.2; they contained a GI fragment slightly longer than that found in the Lp-psGI sequences, extending more or less continuously from 231 bp 5' of the ATG initiation codon to 16 bp before the end of the 5th exon, with subsequent partial homology up to the beginning of the 6th exon (Additional File 3). The GI fragment in Fp-psGI.3 was similar to that in Fp-GI.2, except that it contained a 447 bp deletion covering the 3rd and 4th exons of the GI fragment. This truncated GI fragment corresponded to the smaller PCR product obtained in some of the DNA pools from the F. pratensis BAC library screened with GIGgt2f/2r. In total, Fp-psGI.2 and .3 shared sequence homology, interrupted by two major deletions in Fp-GI.3, over c. 5.1 kb region of Fp-GI.2 but showed no apparent homology with either Fp-psGI.1 or the Lp-psGI sequences outside of the GI region. The conservations of exon- and intron-derived sequences within the GI fragment in Fp-GI.2 in comparison to GI were 92% and 78%, respectively, indicating slightly greater conservation of exon and intron sequence than was observed for the Lp-psGI sequences (83–86% and 72–73%); Table 1). The equivalent figures for Fp-psGI.2 in relation to the Lp-psGI sequences were 79–81% for exons and 71–73% for introns. SEEDTOP searches of the LpGT library identified 98 out of 16384 patterns with > 10 LpGT sequence alignments. Examination of these identified 7 possible helitron hairpin types (Fig. 5, Additional File 4). The most common type, represented 51 times in the LpGT library (using the criterion of clearly non-homologous sequences, at least 40 bp of sequence present both 5' and 3' of the hairpin motif and no N scores), was the 5'-GTGCGCCAAGGCGCAC-3' 'Type 1' motif present in the Lp-psGI sequences. In addition to the 16 bp hairpin and the CTAG↓T terminal motifs, the 11 bases 5' of the hairpin and the 8 bases between the hairpin and the CTAG↓T were also strongly conserved. There was no apparent homology between any of the 51 sequences 3' of the CTAG↓T and only limited homology 5' of the hairpin which was probably due to the AT rich nature of this sequence. Between the different hairpin types, the length of the hairpin sequence varied from between predominantly 16 bp (types 1, 4–7) to predominantly 20 or 21 bp (types 2 and 3 respectively) with 1 to 4, but usually 2 non-complementary bases separating the 7–9 mer complementary sequence stretches. The hairpin was separated from the CTAG↓T motif by 7 to 9 bases for all hairpin types identified. Putative helitron hairpin and 3' border motifs identified in the L. perenne GeneThresher ® database with the SEEDTOP search. Five examples of each of the 7 hairpin sequence types are illustrated; the total number of each type identified is given in brackets. Large horizontal brackets indicate hairpins, small horizontal brackets indicate CTRR↓T 3' helitron border. DNA base colour scheme relates to relative sequence conservation across all examples of each putative helitron hairpin and 3' border motif identified, not just the 5 examples of each type illustrated (see Additional File 3). The discovery of the helitron families of transposons in plant species over the last few years has largely been a consequence of the availability of comprehensive genome sequence for the models rice and Arabidopsis, and latterly for maize. The significance of this has been demonstrated by recent analyses in maize, which have shown the potential of helitron transposition for generating haplotypic diversity and disrupting gene function [4, 8, 10–12]. There are still few reports of helitron-like transposons in the Pooideae grasses, a sub-family that includes the Triticeae cereals and the Poeae forage and amenity grasses, probably as a consequence of a necessary focus on transcriptome-based sequencing within these medium and large genome species. Consequently, the extent to which helitrons are present in, or may have had a role in modelling these genomes is at the moment unknown (though information for B. distachyon another Pooideae grass, should soon become available). Therefore, the identification of a putatively complete, non-autonomous helitron sequence as well as a number of partial helitron-like sequences in the species L. perenne and F. pratensis is important in confirming that helitron activity may have played a significant role in genome modelling within the Pooideae. The complete non-autonomous helitron sequence, Lp-psGI.1, is not dissimilar to helitron-type transposons from other plant species, in that it has the expected 5'- TC and 3' hairpin and CTRR terminal motifs as well as showing apparent transposition into an AT target sequence (Figs. 1 and 2). Additionally, again as with similar helitron sequences, there is evidence that gene fragments have been captured within the helitron, in the present case fragments from a succinate dehydrogenase gene, a ribosomal protein gene and a fragment derived from the gene GI (Fig. 1). The partial helitron sequences Lp-psGI.2, Lp-psGI.3 and Fp-psGI.1 show a highly similar internal structure to Lp-psGI.1 towards the 3' end and so were, presumably, derived by transposition of the same ancestral helitron before the divergence of the Lolium and Festuca genomes; for Lp-psGI.2 and Lp-psGI.3, the fact that there is little homology between the 3 sequences beyond the 3' and 5' termini would indicate that they represent separate transposition events, as opposed to haplotypic variants. Whether Lp-psGI.2/.3 and Fp-psGI.1 represent partial sequences of complete helitrons or the complete sequences of helitron remnants has not yet been established. There is no clear relationship between the helitron associated GI sequences (Lp-psGI.1/.2/.3 and Fp-psGI.1) and the two independent fragments (Fp-psGI.2 and .3). The latter are relatively more closely related to the intact LpGI gene, with the helitron fragments being significantly diverged both from LpGI and the available Triticeae sequences. GI is a single copy gene in rice and only a single GI copy exists in the current Brachypodium genome draft, but two divergent and unlinked GI loci have recently been described in maize . The ryegrass and fescue GI fragments may therefore be remnants of similar ancestral duplications in the temperate grass genomes, whose intact descendants have been lost. It is surprising, however, that two apparently different GI lineages should both have become extinct leaving similar sized fragments preserved simultaneously in at least one genome (fescue), particularly if helitron activity was responsible for one fragmentation but not the other. We considered whether capture by a helitron may have accelerated the divergence of the Lp-psGI.1/.2/.3 and Fp-psGI.1 lineage from a Fp-psGI.2/.3 fragment progenitor but this seems unlikely for at least two reasons. Firstly, comparing the divergence between the helitron GI sequences indicates that they have acquired a relatively large number of indels since their origin from a common ancestor, but that the number of point mutations is not remarkable (there are 7 indel differences between Lp-psGI.1 and Fp-psGI.1, for example, and only 2.7% sequence variation despite separation of the two host species by ~2.8 myr, compared with 6 indels and 13.5% sequence variation between the same region of LpGI and the gene from barley, whose last common ancestor was ~35 myr . Secondly, divergence from LpGI is significantly higher in the intron sequences of the helitron GI fragments than in their exons, consistent with the expected selection for GI protein function. However, this contrasts dramatically with the large proportion of non-synonymous mutations, particularly generating frameshifts and stop codons, within the exons, indicating strong selection against this function. This suggests that the progenitor of the helitron GI sequences did indeed evolve gradually as an intact and functional GI gene, giving rise to a lineage distinct from LpGI and Fp-psGI.2/.3 but that at some stage its coding function became severely deleterious. This may have occurred before capture by the helitron or relatively soon after, as most inactivating mutations are shared by the elements described here. The closer relationship between Fp-psGI.2/.3 and LpGI suggests that the independent GI fragments may derive from a more recent duplication which also suffered a subsequent extinction under selective pressure. Consistent with this, there is less divergence between Fp-psGI.2 and Fp-psGI.3 than between any two of the helitron GI fragments, while there is still a high level of non-synonymous differences from the LpGI and Triticeae GI sequences. An interesting question is whether the pre-existing helitron fragments could in some way have been responsible for the coincident fragment size of Fp-psGI.2 and Fp-psGI.3 or whether there is some inherent reason for GI to be disrupted in this way. In order to address this, we are currently investigating whether intact or recently fragmented GI genes related to either of the two extinct Lolium/Festuca lineages still exist in related species. The observation that the common ancestral helitron from which Lp-psGI.1–.3 and Fp-psGI.1 were derived had captured GI and other gene fragments is of interest from two angles. Firstly, although these sequences are only fragments, replication and transposition following their capture has increased their copy number. Whether this had any direct consequence in terms of the perception and response to photoperiod is unknown, but the observation of apparently independent extinction of a subsequent GI duplication does suggest that the helitron capture and/or fragmentation may be beneficial to the host genome in helping to eliminate expression of unnecessary or deleterious duplicated genes, possibly in response to new selective pressures. A further question remains as to the positions of the Lp-psGI sequences within the L. perenne genome relative to each other and to GI itself, which maps to chromosome 3. To resolve this, attempts were made to identify allelic polymorphism across the 3' and 5' borders of the Lp-psGI.1–3 sequences in the mapping family, but amplified PCR products showed no sequence variation (data not shown) and, so, the Lp-GI sequences could not be assigned a genetic position. The process(es) by which helitrons capture foreign sequences has yet to be clarified and either 'read-through' errors at the 3' terminus or a mechanism based upon non-homologous repair of double-stranded DNA breaks have been suggested [1, 2]. Comparison of the Lp-psGI and GI sequences identified here provides some suggestion that the original capture of the GI fragment may have occurred by helitron expansion at the 5' end, a possibility referred to by . Alignment of the Lp-psGI fragments with the equivalent GI gene sequence shows that the 3' border terminates with a potential A↓T helitron insertion site (Fig 4). It is therefore possible that helitron insertion originally occurred within this site in GI and upon subsequent transposition there was 'slippage' of the 5' helitron border resulting in incorporation of a fragment of GI. A similar mechanism is a possibility for the incorporation into Lp-psGI.2 of a sequence homologous to LpGT fragments a, b, and c, as illustrated in Fig. 3. There remains the major question as to how ubiquitous helitrons are in the L. perenne and other Pooideae- genomes – a question that will only be definitively answered by the accumulation of contiguous genomic sequence for these species. However, the LpGT library does represent a collection of hypomethylated, presumed gene-rich [36, 37] though relatively short (mean = 502 bp) genomic sequences. This size-range limitation means that they are unlikely to contain complete helitrons, but could contain recognisable helitron 3'-border motifs. Searches of the LpGT library for short sequence stretches containing potential hairpins and the CTRR 3' helitron border motif identified 7 sets of sequences (Fig. 5 and Additional File 4). If these do represent true 3' helitron borders, this indicates that helitron activity in L. perenne may have been relatively widespread in recent evolutionary history, as evidenced by the presence of these sequences in presumed hypomethylated regions of the genome (i.e., their representation in the LpGT library) and by the sequence conservation across the hairpin types identified. The SEEDTOP search identified 172 non-homologous sequences containing potential 3' helitron termini. However, it should be born in mind that this is very limited survey of the L. perenne genome, identification relying on: a) representation within cloned, hypomethylated regions, b) the 3' helitron motifs conforming to the SEEDTOP search parameters (eg. 'perfect' complementary 7 mers) and c) > 10 copies of the same helitron type being present in the original search. Therefore, if these do represent real 3' helitron borders, the actual number of helitrons in the L. perenne genome may be considerable. This being the case, as comprehensive genome sequence becomes available for L. perenne and the various Pooideae species, it will be interesting to see the extent to which helitron activity may have been responsible for modifying and diversifying these grass and cereal genomes. An apparently complete non-autonomous helitron and a related series of incomplete helitron sequences have been identified in the Pooideae grasses Lolium perenne and Festuca pratensis. The identified helitrons had captured a number of gene fragments, including a fragment of the key flowering gene GIGANTEA. Searches of a L. perenne GeneThresher® DNA sequence library identified a number of possible 3' helitron borders in unrelated sequences. This represents evidence for a possible ancestral role for helitrons in modelling the genomes of Lolium and related species. The L. perenne (c. 5 × genome coverage) and F. pratensis BAC libraries (c. 2.5× genome coverage) have been described previously [38, 39]. Derivation of copy number estimates from PCR screening of the BAC libraries is described in Additional File 1. The L. perenne GeneThresher® (LpGT) DNA sequence library database was obtained on license from ViaLactia Biosciences, Auckland, New Zealand and was described previously [40, 41]. The F2 L. perenne mapping population (n = 187) and framework map has been described previously . GI was mapped as a segregating CAPS marker detected as a Tat1 (Fermentas, York, UK) restriction enzyme polymorphism in a PCR product amplified from the the 10th exon of the GI gene using primer pair GIGgt1F/1R. The marker was placed on the existing genetic map using Joinmap v. 3.0 . GI and psGI sequences derived from L. perenne and F. pratensis were aligned with other plant sequences in GenBank and with the local LpGT library database using BLASTN. Further alignments and manual adjustments were performed using ClustalW  and Macaw version 2.0.5 . Exon and intron sequence similarities between GI and the psGI fragments inserted in the Lp/Fp-psGI sequences (Table 2) were calculated after ClustalW alignment and manual adjustment both directly on the complete sequence alignments and after exclusion of base insertions and deletions (i.e., reflecting base substitutions). Potential helitron 3' hairpin and CTRR motifs were identified by searching the LpGT library with SEEDTOP (part of the stand alone BLAST executables package ) for sequences of the form N1N2N3N4N5N6N7x(0,5)N7N6N5N4N3N2N1x(0,12)CT [GA] [GA]T, where Nsuperscript is a defined base and Nsubscript is its complement, x(n1, n2) is a number (n) of undefined bases between n1 and n2 (inclusive) and [GA] is either G or A. N1–N7 consisted of all possible nucleotide 7 mers, giving 16384 search patterns. Where > 10 different LpGT sequences were identified by an individual search pattern, the LpGT database was additionally searched with the reverse complement of the search pattern and the sequences were examined for possible helitron 3' motifs using Macaw sequence alignments. Identical or near identical LpGT sequences with different identifiers were only included once in the analysis. Possible helitron motifs were identified on the basis of sequence conservation across potential hairpin and CTRR motifs with low sequence homology 5' and 3' of these motifs. For illustration, c. 110 bp of sequence flanking the putative helitron motifs were aligned using ClustalW with manual adjustment in GenDoc (Figure 5, Additional File 4). This work was supported by the Biotechnology and Biological Sciences Research Council (BBSRC) UK. The L. perenne BAC library was funded as part of the EU Framework 5 GRASP project. The help of Zac Hanley, Sathish Puthigae and Margaret Biswas (ViaLactia Biosciences) in the publication of cited sequences from the L. perenne GeneThresher® resource is gratefully acknowledged. IA and TL designed the study and analysed the data, all authors contributed to the execution of the study, IA, TL and KF contributed to the drafting of the manuscript and all authors read and approved the final version. Plant DNA C-values Database. [http://data.kew.org/cvalues/]. NCBI BLAST ftp directory. [ftp://ftp.ncbi.nlm.nih.gov/blast/executables/].